Man's Best Friend Is a Bug! 600 years ago, in the early 24th century, mankind met alien intelligence – the insect Thranx. Despite their physical differences, humans and thranx soon found they had much in common. Within a hundred years, they had united as the Humanx Commonwealth. Today, humans and thranx stand shoulder-to-thorax against the ruthless reptilian AAnn, defending the dozens of intelligent races and hundreds of inhabited worlds that make up the Commonwealth. GURPS Humanx, a world book for GURPS, takes you planet-hopping through Alan Dean Foster's Humanx Commonwealth, where Ethan Fortune and Skua September sailed the Icerigger across the frozen wastes of Tran-Ky-Ky, Flinx and his minidrag Pip activated The Tar-Aiym Krang and solved the mystery of Bloodhype, and the great whales still swim the seas of Cachalot. The Commonwealth Gazetteer, a spacefarer's guide to humanx space, detailing 28 worlds within the Humanx Commonwealth. The Gazetteer describes the climate, sentient races, interesting creatures, spaceport facilities and adventure possiblities on each of these worlds. Complete rules for player characters of nine alien races: Thranx, Ornithopes, Tholians, AAnn, Dolphins, Tran, Saia, Mai and Tsla. A complete galactic history and timeline, from half a billion years in the past through the six centuries of the Commonwealth. Equipment from the Commonwealth novels, ranging from the Cetacean Translator to the Samstead Duty Suit, plus weapons like the Phonic Stiletto and the Neuronic Pistol. Complete GURPS stats for humanx characters, including Flinx and Mother Mastiff, Maxim Malaika, Bran Tse-Mallory and Truzenzuzex, and their AAnn nemesis, the Baron Riidi WW. A complete multi-session adventure set in Drallar, on the world of Moth. 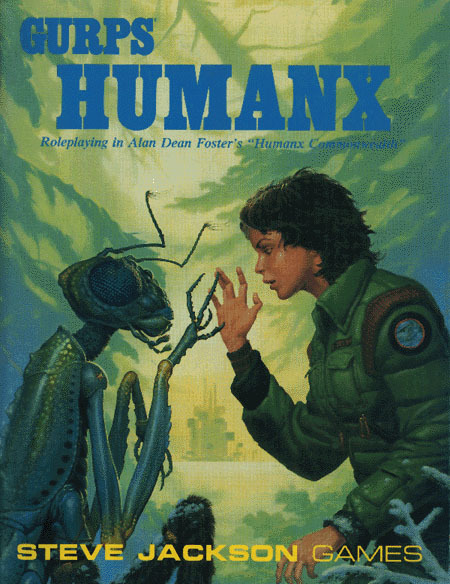 GURPS Humanx: For Love of Mother-Not – A solo adventure in the Humanx Commonwealth. GURPS Aliens – Over two dozen new races for your campaign! Use them in any science fiction adventure . . . or fantasy, or horror. GURPS Space – The ultimate toolkit for any Third Edition campaign between the stars.